CHANDLER, ARIZONA - Geoff Evila miraculously recovered from a four month coma after a near fatal car accident that took place in early June this year during a road trip to Las Vegas. Weeks after his amazing recovery Evila learned that the iPhone had been launched to overwhelming success. Before his accident Geoff had planned to camp out in line for his very own iPhone, but without any warning everything suddenly went black. Geoff realized that he had some catching up to do as he began to put the pieces of his life back together. Geoff's closest friend Steve Denots asked the local Apple Store in Chandler, Arizona to create a huge scene for Geoff Evila when he arrived last week to purchase his iPhone, similar to the high energy scene that took place on June 29 when the iPhone was released. Denots told the Apple Store staff Geoff's harrowing story of recovery and carefully designed the event to be a surprise for Evila. 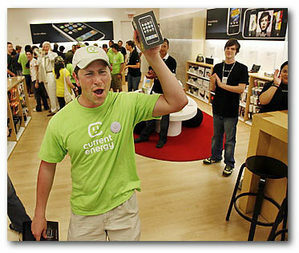 "I was so psyched that the store agreed to play along," said Denots "Geoff was blown away, he limped through the store holding up his iPhone proud as can be while everyone cheered him on. I had the old Geoff back except now with a better phone, his last Verizon phone sucked." Though Geoff Evila is recovering brilliantly, Denots did not have the courage to inform his best friend that the Apple Store scene was a set up. "Geoff believes it's real, so that makes it real," said Denots "I'm just glad to have him back alive and well." Denots told The iPhone Savior that Geoff is enjoying his new phone despite his struggle with small motor movement which represents the final hurdle in Evila's recovery. For Geoff Evila, life has become a whole lot better waking up to the iPhone. You would have to be in a coma to believe otherwise. Didn't South Park do this with the PS3? Coincidence? I think not. Brilliance? Indeed it is. hehe.. This story is funny.. good, he is saving $200. This story is so fake it makes Weapons of Mass Destruction spontaneously appear in Iran! wow!! i would have totally been on board to do another iphone launch had i known this was going on. after camping out for the original launch in NYC and braving the rainstorm, this would have been a walk in the park. on top of that, this time i would have saved $200 clams!! priceless!! This story is definitely real. And no one will convince me it's fake. Do you think George Washington really cut down that cheery tree? No, but it's okay because it makes us all feel good and that is what's important. Hey, I went into a coma five years ago, just as I was about to buy some Apple stock. Now that I'm out of it, I think it's only fair I should pay the price as it was then. I find that story rather tasteless, however funny it may be. Yeah I shop at the Chandler Apple store and I have nothing else interesting to say. I'm sorry. Shoot me! The main characters names are "Stoned Alive" when spelled backwards and put together. I love it! Well written! Every picture tells a story. You had me hooked and Crunch Gear too. Props! Anyone notice that his last name is STONED backwards? And his buddy's last name is ALIVE backwards? But man, you throw enough stupid at the Diggsters, and your traffic is going to boot those Ad words checks up to where you want them. This story is brilliant satire! ah nerds and their iphones. Will you ever shut up about your bricks? iPhone brought me out of the coma I was in, too... using Treos and HTC 8525. After using ATT for a while, he'll wish he were back in that coma till the contract expires. They need to print the end of the story. "Evila later slipped back into a coma after he found out AT&T is the carrirer." Did they charge him the original $600 for the phone as well? So of course I wonder - in order to fully recreate the illusion, did he pay the original $600? so I assume that he's not there mentally 100%. I mean you'd figure out the whole setup thing eventually. This is a sad example of how the things we own, end up owning us. A very touching story. Here's to Geoff's complete motor skills recovery! Yeah, I'll bet Steve saves kittens tied to railroad tracks like every day. Steve like totally RULES DUDE!!! Save us from ourselves Steve, you godlike hunk o' genius, you. I bet he gets an email from Steve Jobs as well. Steve is that kind of guy.